I don’t imagine that anyone who has seen it will ever forget the cockpit video of US Apache attack helicopters mowing down two Reuters journalists and ten other civilians in Baghdad in July 2007. It was part of the cache that the principled and courageous Bradley Manning gave to Wikileaks, which released the full, unedited clip as Collateral Murder in 2010, and earlier this month Manning’s lawyers opened their defence with a showing of the same video. The transcript of the video is here, and a redacted copy of the US Army’s investigation report (with annotated video stills) is here. 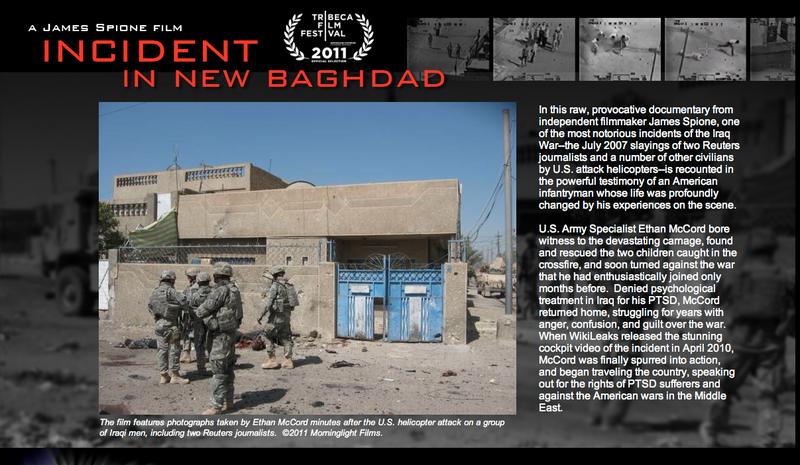 The incident has been the subject of two short documentary films, linked by a common figure, Ethan McCord, a US soldier who arrived at the scene minutes after the shooting began (more here). The second is James Spione‘s Incident in New Baghdad, which won the prize for the best documentary short at the Tribeca Film Festival in 2011 and for best picture and best documentary short at the Fargo Film Festival in 2012. Psychologists call it “psychic numbing.” Tell someone that tens of thousands of civilians have been killed in the Iraq conflict, or that thousands of U.S. veterans of our Mideast wars suffer from crippling PTSD, and their eyes will likely glaze over. Most people simply cannot comprehend the meaning of such vast numbers, nor are they likely to show any particular concern. Conversely, however, the tale of a single tragic incident can create great empathy in the same person–and greater understanding of the wider effects of war. My short film INCIDENT IN NEW BAGHDAD examines what happened that day from the first-hand perspective of an American infantryman whose life was profoundly changed by his experiences on the scene. U.S. Army Specialist Ethan McCord bore witness to the devastating carnage, found and rescued the two children caught in the crossfire, and soon turned against the war that he had enthusiastically joined only months before. Denied psychological treatment in Iraq for his PTSD, McCord returned home, struggling for years with anger, confusion, and guilt over the war. When Wikileaks released the video of the incident, McCord was finally spurred into action, and began traveling the country, speaking out for the rights of PTSD sufferers and against the American wars in the Middle East. However, there is so much more to the story, and I am now developing a more in-depth, feature-length examination of this incident that will include the perspectives of many more people involved in this incident: the infantry on the ground; the families of both Noor-Eldeen and Chmagh; the children, whose father was killed in front of them in the van, as well as their mother; and if possible, the 1-8 Cavalry Airborne gunner who pulled the trigger. My hope is that, by hearing from all of the first-hand participants of this tragic event, we may come to better understand the profoundly damaging consequences that ripple out through the lives of survivors over many years from just one so-called “engagement” in a war. And when we learn from all involved that this incident was not an aberration, but a commonplace occurrence over the course of many years, perhaps then we will start to understand those mind-numbing statistics, and feel the true moral scale of the damage, the wounds, the folly of a war of choice that never needed to happen. I rehearse all this now for two reasons other than the shadow of sentencing that now hangs over Manning (though that is reason enough) . First, the video at the dark heart of this incident – and these films – was not captured by a Predator or Reaper thousands of feet in the air and fed back to pilots, screeners and commanders thousands of miles away in the continental United States: this was close-in and immediate, and this raises important questions about scopic regimes and military violence that spiral far beyond the usual (and I think narrowly framed) debate over drones. Second, Incident in New Baghdad was part-financed by Carol Grayson, who became one of the film’s executive producers. She is clearly a remarkable woman in all sorts of ways, not least because she has spent much (I suspect most) of her time since then working on a new documentary film project, The Approximate Target that charts ‘the human cost of remote control killing, the dangers of covert government policy and unaccountability in modern warfare.’ It’s been a long, difficult and continuing journey with seemingly no end of obstacles and obstructions: you can read more on her blog here. Your silence in the face of these injustices only makes matters worse. If the strike was a mistake, the family – like all wrongly bereaved families of this secret air war – deserve a formal apology. To this day I wish no vengeance against the United States or Yemeni governments. 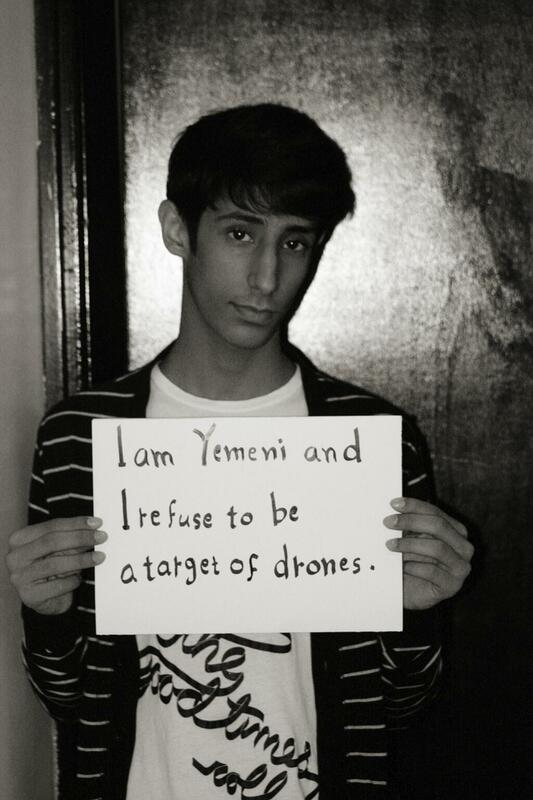 But not everyone in Yemen feels the same. Every dead innocent swells the ranks of those you are fighting. This entry was posted in drones, film, Iraq, Pakistan, Yemen and tagged Bradley Manning, Carol Grayson, Collateral Murder, drones, Ethan McCord, Incident in New Baghdad, James Spione, Reprieve by Derek Gregory. Bookmark the permalink. I am amazed at the zen like courage by the van people. Yes I heard the part about bringing kids to battle. These people are not so hardened by the 21 century, maybe didn’t even hear about how science is God to the A_list countries.